Looking for fun things to do in Santa Fe, New Mexico. Well, Santa Fe has gone to the dogs!!! OK, not literally, but there are a wealth of things to and places to see when traveling with pets to Santa Fe that are dog friendly. Santa Fe is a city bursting with history and unique southwestern architecture. It is also a very walk-able city, making it perfect for exploring with your hound in tow. There are a ton of dog friendly hikes through the gorgeous mountainous terrain of Santa Fe, but before we get to those, let’s take a look at a few pawsitively pet friendly restaurants. And, you might even stumble upon a couple of wonderful wineries. We know you will work up a hunger with all that walking and window shopping and the following restaurants are just a few of the outdoor patios that allow leashed dogs on their premises. The Counter Culture on Baca Street has a large, shady outdoor dining area. The Atomic Grill located on Water Street in the heart of downtown Santa Fe, offers not only a dog friendly patio, but free wi-fi and over 100 different choices of beer. The Atomic Grill claims to have the best patio seating in downtown Santa Fe and it is a great place to hang out with your dog. And finally Louie’s Corner Café has gotten high marks for the wait staff’s quick attention to canine customers’ need for water bowls and its shady patio where dogs can hang out and wait for patrons to drop food. 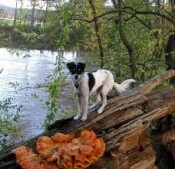 Hiking is a big pastime in Santa Fe and a number of great hikes are dog friendly. Remember to pack water for both you and your hound, and make sure you have bags to clean up any waste from your dog as well. All hiking trails listed are leashed dog friendly. Atalaya is a hike that takes you up to an elevation of 9100 feet. It starts in the parking lot of St. John’s College and heads up and up Atalaya Mountain. Borrega Trail is a hike through a high-alpine forest which is great for both dogs and kids. The entire hike is tree cover, making it a shady stroll. Namba Lake This hike is available as an offshoot of the Santa Fe Baldy trail. Follow that trail through the gate and down the long descent at the beginning of the hike. At the bottom of the hill, take a right and you will see a gorgeous alpine meadow that usually has grazing cows meandering along it. From this point, if you follow the trail to the left and start to ascend you will notice a steep climb. If you make it to the top, you will come upon a blue high-alpine lake. For those who are more physically fit, this moderately strenuous day hike in the Santa Fe National Forest takes you to the highest summit in the Pecos wilderness. The hike has an elevation gain of 2,322 feet, with the highest point being 12, 622. Be aware of signs of altitude sickness. This hike is open from late May until November. Santa Fe is filled with wonderful activities for family and pets. Vacation Pet Friendly has a the largest selection of pet friendly hotels online, not to mention kennels and doggie day care designed to make booking dog friendly travel a breeze. Remember, booking early is essential when traveling with pets. See what’s available today so you get the best deals. Start your search for pet friendly hotels in Santa Fe here. Check out our hotel listings for Santa Fe, which are chock full of options for any taste and budget. Then go to our Santa Fe Travel Guide and find all the wonderful fun things to do with pets in Santa Fe. Then sit back and think of all the fun things you can do when you get there!